What's the deal with the locomotive? I'm a railroad fan, so I designed a locomotive into a soundhole inset for my hammered dulcimer. James Jones hand-cut and installed the inset when he built the instrument. What is a hammered dulcimer? A hammered dulcimer is a lot like a piano soundboard ... without the piano wrapped around it. It is a large wooden soundbox with strings stretched across its face, usually in pairs or triplets. The strings are held above the surface of the soundboard by bridges, and the instrument is played by hitting the suspended strings with small mallets, called hammers. The hammered dulcimer is a very old instrument, perhaps dating back to biblical times. 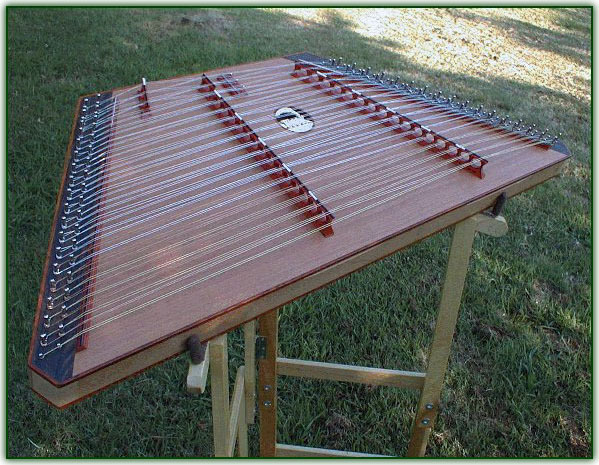 Variations of the hammered dulcimer are found in cultures around the globe; these include the Persian and Indian santoor (or santur), and the Chinese yang qin. The instrument pictured here is the 3/17/17 hammered dulcimer I play. 3/17/17 means that there are 3 string pairs (called courses) on the short bridge (upper left), 17 courses on the treble bridge (center), and 17 courses on the bass bridge (right). Like my first instrument, this one was built for me by James Jones, and I am very pleased with his craftsmanship and its tone. My sister makes and sells custom hammered dulcimer covers such as the one pictured here, covering my dulcimer. 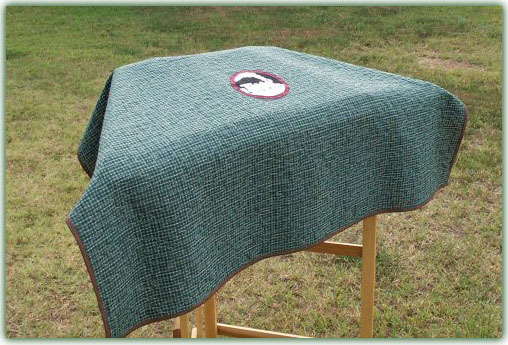 The covers are approximately 44" X 54", made of 100% cotton with a liner of flannel, and can be machine washed. She uses no batting between to keep the item lightweight. When ordering, you can dictate the colors and whether you want a general design (such as a pieced quilt design) or a custom cover such as she did for me; notice that the cover has a large image of my soundhole inlay design. These are great for keeping dust off of a dulcimer around the house and for protecting the instrument between workshops at a festival.